If you're a fan of driving a manual transmission it is likely because you enjoy having full control over your vehicle and feeling the power of the engine as you shift through the gears. To ensure you continue enjoying the driving experience be sure that you keep up with clutch service as necessary. If you notice any of the following signs of clutch repair it is imperative that you contact your local auto repair shop for service. One of the most common signs of clutch trouble is if the clutch feels spongy or if it rests closer to the floor that it used to. This is generally a sign that the clutch plate has worn thin and is due for repair. Alternatively this may also indicate a failure of the clutch linkage, which may require a replacement. Linkage issues can also result in a very stiff clutch pedal. If you notice any changes in the way the clutch feels as you shift through the gears it's a good idea to visit your local shop. Does your car tend to pop out of gear? Is this especially common while accelerating out of first gear? This is a normal sign that it is time for clutch service, likely because the clutch plate has worn thin. This can be caused by another issue, however. If engine oil leaks onto the clutch plate it could cause the gears to slip as there would be an excessive amount of lubrication present during shifting. Do you remember that burning smell that would be present when you were first learning to drive a stick shift? If you begin to notice that smell as you shift through the gears now that you have perfected your shifting capabilities, it's likely time for clutch replacement or adjustment. You may also catch a whiff of this odor if you accelerate through gears going up a steep hill or if you move through stop and go traffic. The clutch is a critical component for your vehicle, so be sure to pay attention to its needs. 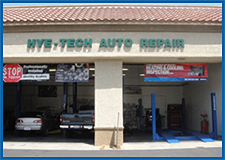 If you believe that you need clutch repair in Covina or the surrounding area head to Hye Tech Auto Repair. Our auto repair experts will have you back on the road in no time. Call today at (626) 332-5452 to request an appointment for auto repair in Covina.